It's been years since anyone has asked me where I get my protein, but man, I wish somebody would! 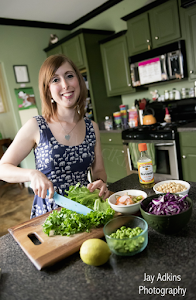 I feel like most non-vegans now understand that protein is found so many foods (not just meat), but back in the day, I swear I got that question all the time (as did every vegan everywhere). Veganism wasn't so mainstream back then, and while some folks were just being obnoxious, many genuinely wanted to know how a vegan diet was sustainable. Back then, I'd always answer, "tofu, tempeh, seitan, beans, nuts, and seeds." But today, I'd also add "smoothies, waffles, cookies, shakes, bars, and pasta" to that reply. Yes, pasta! At least when that pasta is made by Explore Cuisine. They make protein-packed, gluten-free pastas from beans and legumes. Perfect for post-run meals! 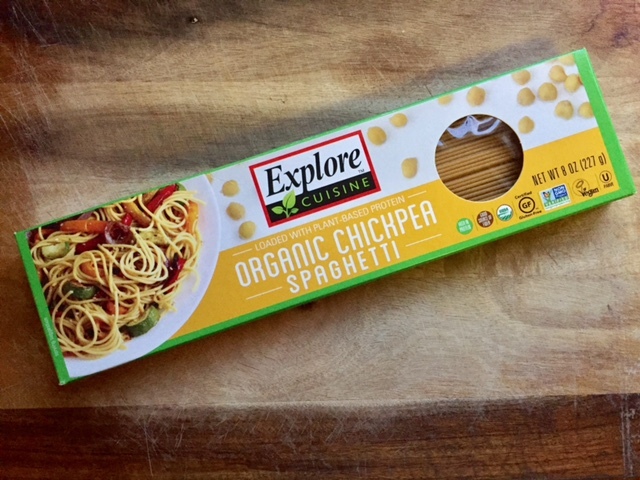 Explore Cuisine sent me some samples of their Edamame Spaghetti and their Chickpea Spaghetti to try for a review. The Organic Edamame Spaghetti is greenish in color, and it packs 25 grams of protein per serving! 25 grams! How do they even do that? The only ingredient is green soybeans! That's it! It's also low-fat (2 grams per serving) and high-carb (22 grams), so this is ideal pasta for athletes. The texture is a little softer than, say, a whole-wheat pasta, but it's pretty well on-par with other gluten-free pastas. Lightly chewy but soft. You can do all kinds of creative things with it, but I simply dumped a jar of Muir Glen Garden Vegetable Pasta Sauce and some IKEA Vegetable Balls on top and called it a day. The serving size is two ounces, but it looked a little small when measured out. But with all that protein, I still filled up quickly! A serving of this pasta and a salad made a meal that kept me satisfied for hours. They also sent me their Organic Chickpea Spaghetti. 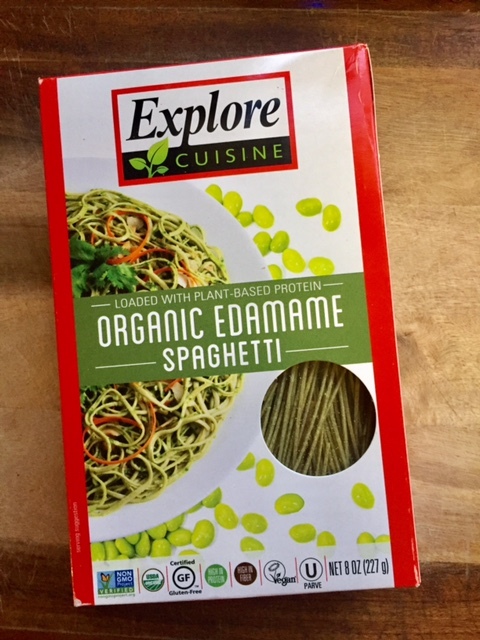 This has 11 grams of protein per serving (lower than the edamame, but still a lot for pasta! ), 35 carbs, and 2.5 grams of fat. 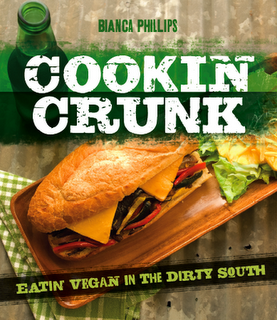 It's made with chickpea flour, brown rice flour, tapioca starch, and pea protein. This was closer in texture to a brown rice pasta, which I've long been a fan of. The trick is to make sure you follow instructions and cook for the recommended time. And of course, you need to do that cold water rinsing trick afterward to firm up the pasta. I imagined this would make a fine carbonara pasta, so I whipped up a quick and easy vegan version using Follow Your Heart's Vegan Egg. By the way, I've never actually eaten carbonara pasta, so I can't say if this is a great replication of the traditional egg yolk sauce with bacon. But regardless, this was delicious! The Vegan Egg made a thick and creamy sauce. I used nutritional yeast in place of the parm, and I added mushrooms because it needed some veggies. For the bacon, I went with Benevolent Bacon by Sweet Earth Foods, but any vegan bacon (even homemade tempeh bacon) would work. Before you do anything else, remove the ice from the water. Add the Vegan Egg and blend with an immersion blender. Or transfer to a blender, and blend until very fluffy. Add the nutritional yeast and black salt. Set aside. While the pasta boils, spray a large skillet with non-stick spray and brown the bacon on both sides. Remove from heat and chop into small pieces. Set aside. In a separate skillet, while the bacon is cooking and the pasta is boiling, heat the margarine over medium heat. Add the onion, and saute 2-3 minutes. Add the garlic, and saute one more minute. Add the mushrooms, and saute another 5-7 minutes or until mushrooms and onions are very soft. Drain the pasta water, and rinse under cool (but not freezing water) for just a second. You want the pasta to still be a little warm to cook the egg sauce. Transfer the pasta back into the still-warm pasta pot (with heat turned off), and pour in Vegan Egg mix. Toss to slightly cook the egg sauce. Add the bacon and mushrooms. Taste for seasonings, and add as much black pepper and salt as needed. Toss with fresh parsley. Serve! That's a nifty way of using Vegan Egg! Ooooh yum!! The edamame version sounds interesting and the chickpea version I imagine is very versatile! I bet it would make an amazing mediterranean pasta salad with chickpea pasta instead of chickpeas! I may have to make that happen ;) The carbonara looks delicious! 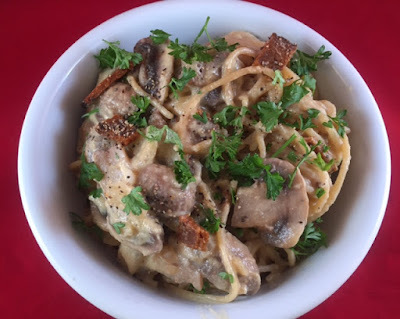 I've never had Carbonara pasta either, but your version sure looks pretty delicious! I have a package of their adzuki bean pasta in my pantry. I've never seen the edamame but I really want to try it! Strangely we had the edamame pasta too this week! We were a bit dubious about the package saying it was 4 servings but with steamed veggies it was filling. For the sauce we had the one from the peanuty perfection noodles recipe from Chloe's Kitchen and it was amazing and I will definitely be making that sauce again. Love the sound of both your dishes. I love their rice noodles too! I got their red rice pad thai noodles and they were perfect! Better than the normal white rice noodles!